Sometimes you can learn most of what you need to know about a knife from its price. This rule of thumb can take you far in the world of knives, because that bin full of $9 ‘Tactical Tanto’ knives at the hardware store probably aren’t fit to open letters with. But assuming that “pricey=good” can also lead you far astray. Opinel and Mora knives are shining, razor-sharp examples of low-priced knives that are far better than many more expensive competitors. You probably just finished reading my War And Peace-length review and overview of Mora knives (find a comfortable chair and click here if you haven’t), but the nutshell version is that they’re incredibly sharp and rugged and you’re a fool if you manage to spend more than twenty-five dollars on one. Including shipping. Another good cheap knife, which we haven’t had a chance to write up yet, is the classic Opinel folder. Along with the Buck 110 and the Ka-Bar, it’s one of the truly classic knife designs I don’t yet own, but I’m working on it. These simple French folders have been favorites of backpackers for many decades. One of the longstanding issues with Opinel knives (other than the unlikely possibility that the safety ring could fail or the handle splinter) was that their carbon-steel blades were prone to rusting if not oiled. Corrosion is obviously a reasonable concern with carbon steel, but it’s not a valid critique of Opinel knives any longer. Opinels, like Moras, are now offered in the excellent but inexpensive Sandvik 12C27 stainless steel. And just like Moras, most Opinels cost around fifteen bucks. The wooden Opinel display case at the top of the page sells as shown (full of knives) for $150. But while we’re on the topic of cheap-but-good knives, don’t forget Ginsu Knives. Yes, those Ginsu knives. You have to remember that commercial, right? Ginsu Knives may have been the joke of late night and weekend TV in the pre-infomercial age, but they’re not jokes today. 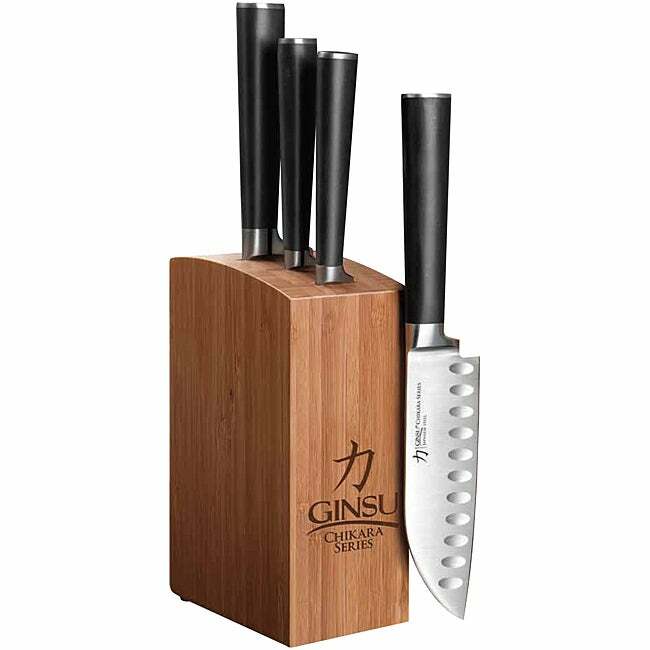 The $75 Ginsu Chikara kitchen knife set tied for fourth place in Consumer Reports latest comparisons, just a point or two behind the Henckels and Wusthof sets costing four to eight times more. Forged from mid-grade 420J2 stainless, these knives don’t rely on the cheap serrations that let the original Ginsu saw through a tin can, but made it a lasting object of derision. Consumer Reports reviews don’t always delve into the technical minutiae that gearheads and knife honks dig, but their ratings are based on lots and lots of data and they seldom get things wrong. What’s the point of all this? Don’t waste your money on the junk in the bucket o’ knives at the hardware store, but keep an open mind (and an open eye) for quality knives where you might not expect them. The fanciest steels don’t always perform noticeably better for all tasks, and pricier really isn’t always better. I had an Opinel in the pre stainless days. It was a very workable knife. But in those days I was rough on my gear and the carbon blade was uglied up by my neglect. I have learned to handle my stuff with more respect, but I like the durability of stainless better. Amazon has that Ginsu set for $49.96. I’ve had thoughts of buying an Opinel; one I haven’t gotten around to acting on. a fair amount of punishment, even rivaling Henckels or Wusthof. downside is that they take a bit more care as the steel will rust. Other famous knives for the working man include the French Douk-Douk, the German K55 by Mercator, and the USA’s very own Case Sodbuster. Just started reading my latest BLADE mag (came 5 days ago) and noted the Gent II on the cover and a letter from a guy who was just introduced to an Opinel knife, liked it, bought 2. Damn, ChuckN, that was my last card to play. Old Hickory, Mora, Opinal; decades of value for little money. But you really never know. I bought a chisel at the dollar store about 10 years ago with the express intent of using as a beater, and it takes as good an edge as my Marples. I still use it as a beater, because hey, a dollar, but when I do sharpen it up, it is keen steel. Of course it’s about half an inch shorter than it was when I got it and the handle is more duct tape than wood, but good steel is good steel. the curse words you’ll utter if, or when, you drop one on a tile floor. And you will drop them. It’s a universal constant. The Dozer designed Kbar folders are one knife I would recommend. It cost just under 20$ when I got it some 10 years ago (I think) and I beat the snot out of it for years. The worst was when it made its way into my toolbox, and my wife used it to scrape linoleum, afterwards, it took a new edge without much effort. When we used it to pry up 2 bathrooms full of mosaic tile floor, I figured it was a goner, but it took a new edge in about ten minutes. The blade finally snapped while I was trying to pry up paving stones in the garden. The most incredible thing was that the blade never loosened in the frame. It was a rock for years and years of trashing. I’v never had a knife stand up to so much abuse, and Id never have dreamed it would be a $20 knife. I’v got to get around to buying a new one (with a spyder-hole this time) one of these days. The Victorinox Fibrox Chef’s Knife is a perennial “best buy” in independent tests by groups like Cook’s Illustrated. It’s a thirty buck knife that outperforms ones ten times the price.